In this report, we will examine the objective scientific research on a billionaire promoted, quick fix, miracle cure, Ed Reform program called AVID - which claims to help low income struggling students simply by teaching them better study habits. No need for lower class sizes and more teachers. No need to make sure parents have a good paying job so kids have a stable home environment and food to eat. In the interest of full disclosure, as a person who grew up in a poverty and knows what is it like to be hungry, I find it deeply offensive for billionaires to be promoting such programs at a time when the child poverty rate in Washington state is 50% and 35,000 students are homeless and living on the street or in the back of a car. 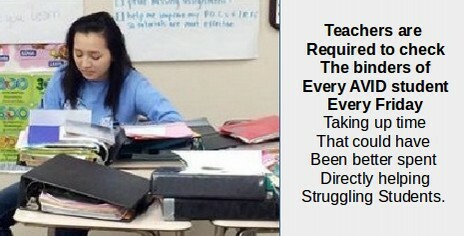 Poor struggling students need much more than just better study habits. It is grossly insulting to blame poor students for the fact that they are struggling in our grossly overcrowded schools - schools that are over-crowded because billionaires refuse to pay their fair share of state and federal taxes. If you do not have time to read the whole report, our conclusion is that there have been only four scientific studies done on the AVID program. All four found that there was no significant difference between students who went through the AVID program versus similar students who did not go through the AVID program. This is shocking since the AVID program, unlike our real public schools, gets to cherry pick which teachers and students get to participate in the program. This is fairly typical of Ed Reform programs. None of them have shown any evidence of working. But they are spread around the US like wildfire by the marketing slogans of greedy billionaires interested in making a buck off off of our public schools. 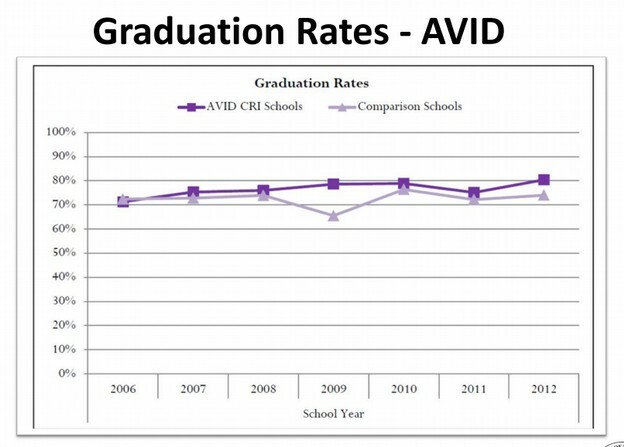 There are two reasons for taking a close look at the AVID program. The first is that 15 school districts in Washington state have already adopted this program. 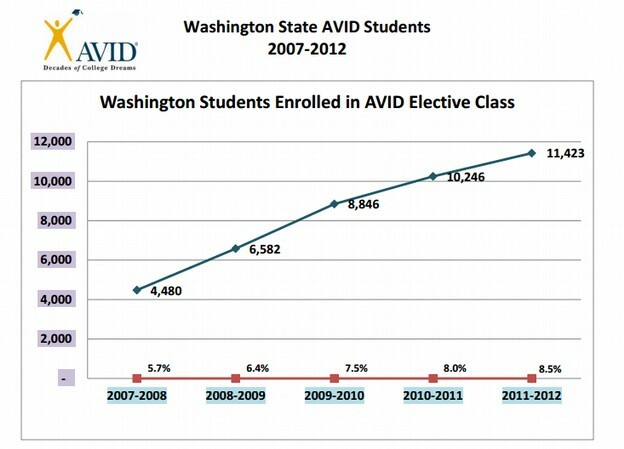 Below is a chart showing the rapid rise in the number of students involved in the AVID program. A recent OSPI study came up with a different result. 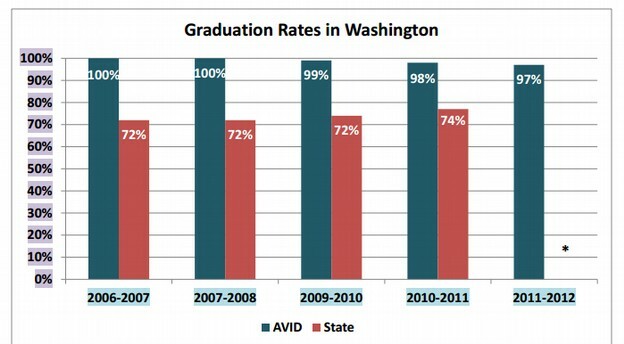 They claimed that AVID schools have a graduation rate of 80%, which is near the state average, but better than some undefined "comparison schools" that are only at 75%. The other reason Washington parents and teachers should take time to examine the AVID program more closely is that Erin Jones, the AVID program director for the Tacoma School District is running for Washington State Superintendent of Public Instruction. At a recent candidate forum, Erin claimed that the AVID program was a huge success in Tacoma and that she wanted to implement something like it statewide if she is elected Superintendent of Public Instruction. Erin claimed that the AVID program was responsible for the dramatic increase in the graduation rate of the Tacoma School District. She seemed to be completely unaware that there has been no increase in the actual graduation rate in the Tacoma School District. Instead, the Tacoma School District artificially inflated their graduation rate by hiding over 800 struggling low income students in an extremely bad online program that only graduates 30% of their students. 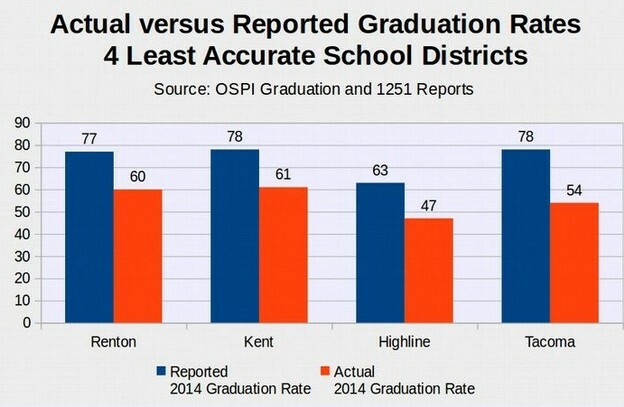 While 7 other large school districts were found to be misreporting the number of students in their 9th grade cohort, the Tacoma School District was by far the worst offender in the entire state of Washington. Setting aside the dishonest tricks used by the Tacoma School District, the question is whether there is any scientific evidence that the AVID program really works to help students. Answering this question is difficult because Bill Gates funded the AVID program and also paid millions of dollars to fake research groups to produce fake studies claiming that AVID works. One needs to wade through a pile of fake studies to find any real research. 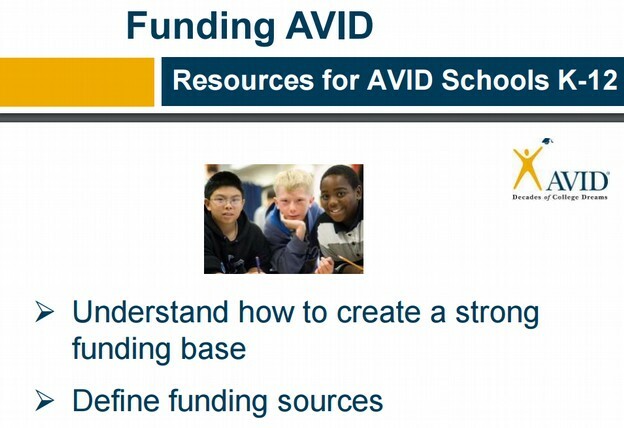 In this report, we will first describe the AVID program and then describe the research that has done about it. AVID (also called Advancement Via Individual Determination) is a program started in San Diego in 1980. It targets "middle achieving students" who are getting Cs and Bs in their courses and tries to "accelerate" their academic development to make it more likely that they will be "career and college ready" by teaching them better study habits like taking notes when they read and then keeping all of their notes for every class in a giant three inch binder. The AVID website claims that they were the precursor of Common Core "career and college ready" slogans and they may be right. Here is a quote from the AVID website: "The Common Core State Standards reflect the path that AVID students and educators have been following for more than three decades." The AVID program subjects a select group of middle achieving kids to a "rigorous" program that includes instruction in taking notes while reading and organizing notes from all of their courses into a huge three inch thick three ring binder that students carry from class to class. Every Friday, there is a "binder check." Note that the AVID program fails to deal with the real at risk students which are students getting Ds and Fs in their school. Even C and B students have to be invited to the program and go through an interview process in which they agree to make a "commitment" to try harder. Thus, it blames the student for their struggles instead of blaming the billionaires who fail to pay their fair share of taxes - thus forcing students to attend schools where the class sizes are too large. So in some ways, the AVID program is like the charter school program called KIPP (Kids In Prison Program). It is a program where every kid is put on an identical path to success as if they were a robot. This makes it very similar to Common Core. Poor struggling kids are expected to pull themselves up by their boot straps. Kids who fail in this boot camp style drill and kill system are simply discarded as not having enough "personal drive." Teachers are taught the AVID system by special counselors during a couple week session in the summer - similar to how Teach for America runs a 5 week teacher boot camp program. So you can think of AVID as a dream come true for Ed Reformers as it is Common Core, Charter Schools and TFA all rolled into one big happy package. Instead of spending billions of dollars to build more schools and provide struggling students with more teachers and lower class sizes, stuggling students are expected to "take responsibility for their own learning." It is interesting how the billionaires want us to focus on all kinds of "magic bullet" schemes like AVID rather than requiring billionaires to pay taxes so we can afford to build schools and hire teachers. These school intervention schemes are so profitable that there are now more than 242 programs like AVID (but with different names) operating in 42 states! Nearly all of these programs divert both federal and state tax dollars away from schools and into the pockets of the promoters of these snake oil magic potions. Speaking of cost, the federal government estimated the cost of AVID at about $10,000 per classroom of 30 students per year. $10,000 per class of 30 kids may not seem like very much. But if comes to $333 per student per year. If the program were expanded to all one million students in Washington state, the cost would be $333 million per year. At 10 experienced teachers per million, this is 3,330 teachers who would have to be fired in the state of Washington in order to pay for this program. So instead of having lower class sizes, struggling students would be forced to deal with higher class sizes. There has been little objective research on the effects of the AVID program on student achievement as measured by students’ performance on standardized achievement tests. 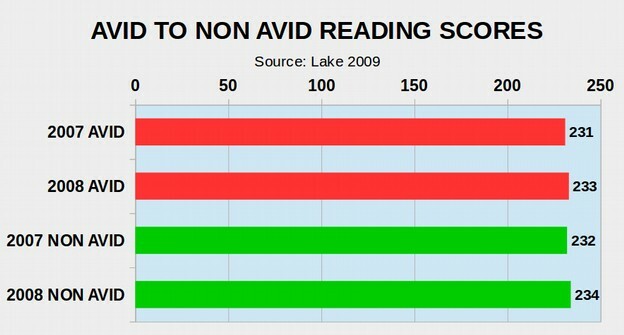 Rorie (2007) found that there was no significant difference between AVID students and Non-AVID students in a Colorado study. 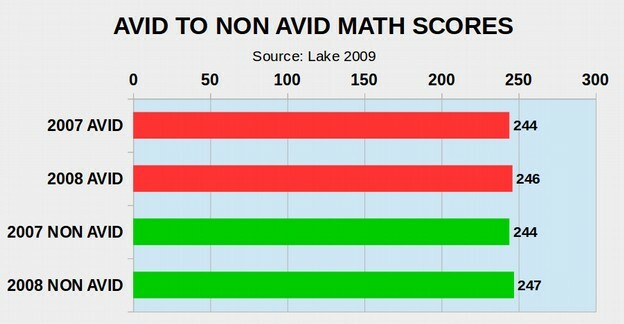 Lake (2009) also found no significant improvement on assessment scores in the areas of mathematics, reading, and writing in a Kansas study. Most shocking was the results of the writing test. Even though the AVID kids had a full year of AVID coaching teaching them how to "write more clearly" they actually performed worse on the state writing test than they had the previous year! In the most recent study, researchers analyzed 14,000 students who had been subjected to the AVID Ed Reform system in the Chicago School District. They were unable to find any significant benefits to the program. Here is a quote describing this study: "As part of a larger initiative to improve student preparation for and access to postsecondary education, researchers working with Chicago Public Schools evaluated the impact of AVID on over 14,000 ninth-grade students' learning and study skills. Researchers drew upon data from the school district; surveys of principals, teachers, and students done by the Consortium on Chicago School Research; and Consortium surveys of students in AVID classes. Survey data was used to evaluate whether AVID students reported more positive learning and study behaviors, greater support from teachers, and increased involvement in college planning. Findings indicated a lack of strong effects, leading researchers to conclude that instruction in supportive skills may not translate to large urban districts, and to question whether a program can improve student skills without changing what is happening in the classroom." What Works Clearinghouse, under the Institute of Educational Sciences, reviewed 66 peer-reviewed studies and found that AVID shows no evidence of impact on student reading comprehension. But wait! 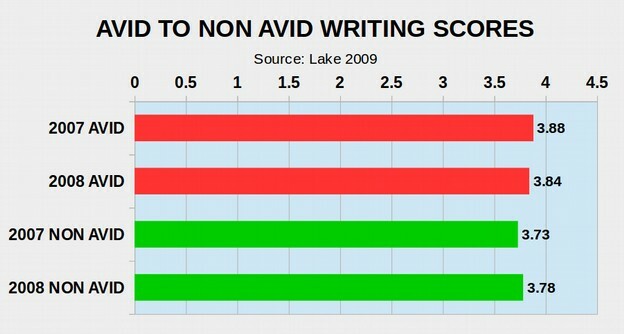 If you go to the AVID website, you will find all kinds of research showing that AVID works very well. For example, the National Student Clearinghouse found that high school graduates from 2010 and 2011 who participated in AVID persisted through their freshman and sophomore years of college at a higher rate than their counterparts who were not in the program. The research found that 87 percent of AVID graduates enrolled in a second year of college, compared to 77 percent of students overall. Sadly, the study was not done by an independent group of researchers. Instead, the National Student Clearinghouse received $7 million from Bill Gates to promote the Gates Junk Science reports on AVID and other Bill Gates Ed Reform scams. This is the problem with allowing a billionaire to fund fake research with his fake non-profit instead of requiring him to pay his fair share of federal taxes so we can have real schools for our kids. The Bill Gates fake research is everywhere and people do not even realize they are being misled by it. But our kids are the ones who pay the real price. Because instead of getting the real teachers and smaller class sizes they need, they get some marketing program and a huge three ring binder. Here is what one student posted on social media asking other students about the AVID program: "OK, so I'm wondering what fellow teens think of the decision my school has made. I am fourteen and just started the eighth grade. At my school, we have a program called AVID. It is supposed to help with 'organization' and uses a three inch giant binder. Now, I'm ADD and have a hard time organizing things, so my mom found AVID and made me take it last year. She wouldn't listen to me that it wasn't for a straight A honors student. It was the worst class ever (for me). The huge binder that held everything for all of our classes didn't work for me- it was horrible." Here was the reply of another student who had been in the AVID program: "I got out of the program for this year (thank goodness) and decided over the summer to try and have three separate binders- each would have the stuff for three classes. However, this year my school is having a mandatory 'Academic Notebook', which is an AVID three inch binder with all of the classes in it. Our school has been selected as an 'AVID Showcase' school- or something like that- and the administration is trying to make it look like AVID is the reason why. The only reason our school does so well is because we are in a very wealthy area. Many kids in my state are children of migrant workers and many schools have 80%+ on free lunch. Meanwhile, the schools in my area have the resources to earn the grades. It has nothing to do with AVID." Here is another student: "Every kid in our school MUST have a three inch binder. It's insane. Several parents are complaining, but the school won't give in. Yes, the AVID binder works for many kids. But not all. Kids and teens who are taking high school credit courses and get A's use different systems for organization- and they do fine. Is it stupid for my school to force all students to use a specific organization technique?" And another student: "It is very, very, VERY stupid of your school to be doing it... I mean seriously, what are they gonna do if you use a different form of organization? Just bring the binder, keep it in your locker, bring it to class just to play their game (that's what school is, a game) and then after a month or so, you can slowly stop bringing the binder and keep all your stuff filed and organized in your own way. That's how I did it, that's how I'll do it this year and I'm getting ready to graduate this year as a junior. So they can shove it!" The kids appear to know more about the program and how to game the system than the adults who are paying for the program. How is it that a program that does this poorly continues to exist and even expand? AVID is yet another in a long line of "magic bullet" quick fix solutions that cherry pick students and ignore the impact of poverty on children and families. AVID is another kids in prison, drill and kill, military boot camp pull yourself up by your boot straps program that blames struggling kids for their problems instead of blaming billionaires. While some students may benefit from the rigid AVID program, most if not all students would be better served by using the money now spent on AVID outside consultants to hire more teachers and offer students smaller class sizes to serve ALL students in the community and build a united program rather than splintering students into AVID versus Non-AVID kids. But what is really needed is much lower class sizes so struggling students can get the help they need to succeed in school and succeed in life. Lower class sizes require hiring many more teachers and building many more schools. The only way to do this is by requiring billionaires to start paying their fair share of taxes in Washington state. If we really care about helping struggling low income students, we should end tax breaks for billionaires and wealthy corporations!